The Dave Clark Five, for a short time, were considered the equal of the Beatles. While that comparison did not last, they did go on to place 16 singles in the American Top 30, which would ultimately propel them into The Rock And Roll Hall Of Fame. The songs delivered a wonderful Christmas present as it reached number one for the week of December 25, 1965. The Dave Clark Five disbanded in the early 1970’s and were a very rare group in that they never performed again. 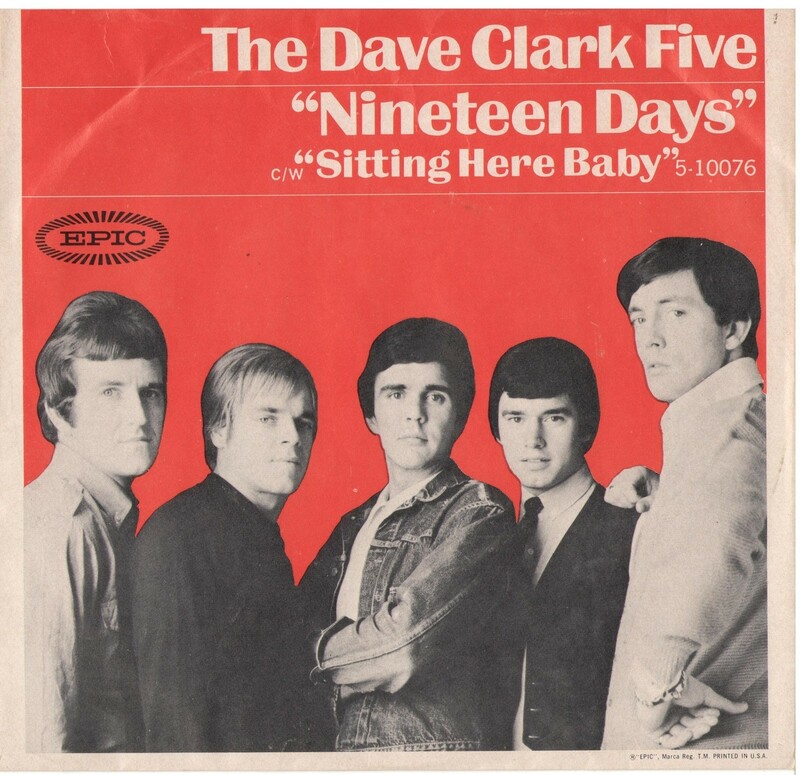 For a short time during the mid-1960s, The Dave Clark Five was compared to The Beatles. While that comparison didn’t work out, they did produce some quality rock and roll, which would eventually lead to their induction into The Rock And Roll Hall Of Fame. They had eight singles reach the BILLBOARD Hot 100 during 1964. 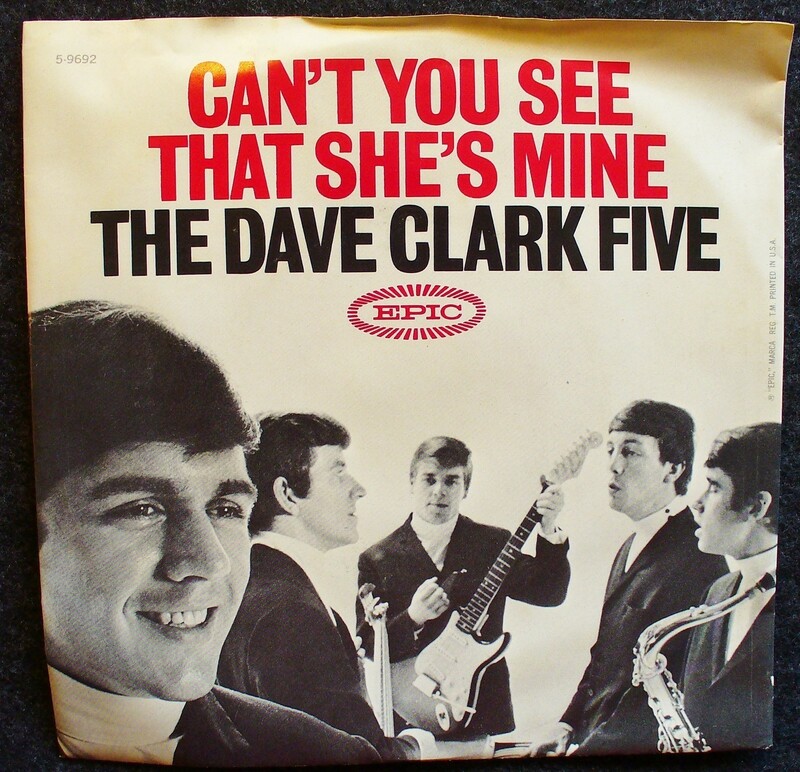 “Can’t You See That She’s Mine” was their fifth release and like “Glad All Over,” “Bits And Pieces,” and “Do You Love Me;” it was a hard-edged rocker, at least by mid-60s standards. It reached number four on the Hot 100. The Dave Clark Five placed 24 singles on the Charts in the United States during a four year period and when they called it quits, they were one of very few bands never to reunite. By 1966, The Dave Clark Five were nearing the end of their string of hits in the United States. They would place six songs on the BILLBOARD MAGAZINE Pop Singles Chart during 1967 but only one would enter the top 30. Their last chart single during 1966 was “Nineteen Days.” It was less melodic than many of their other hits. The highlight was Mike Smith’s lead vocal. It only reached number 48 on the BILLBOARD Pop Chart. It was a bigger hit in New England at the time as it was a record I bought at the time of its release and it still remains in my collection. The Dave Clark Five placed 24 singles on the BILLBOARD MAGAZINE Pop Singles Charts, 1964-1967, and fourteen of the songs made the top 20. “Try Too Hard” remains one of the more obscure of the 14. 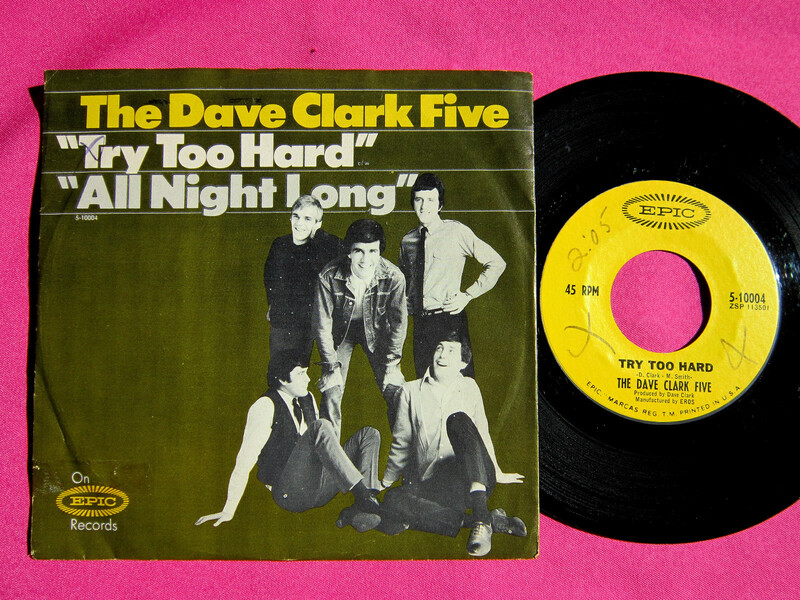 It was a typical Dave Clark Five rock song with Mike Smith’s vocal leading the way. What made it different was the odd beat. The song first reached the BILLBOARD Singles chart April 2, 1966, and during its eight weeks on the chart peaked at number 12. The Dave Clark Five were one of the few 1960s bands never to have a reunion. 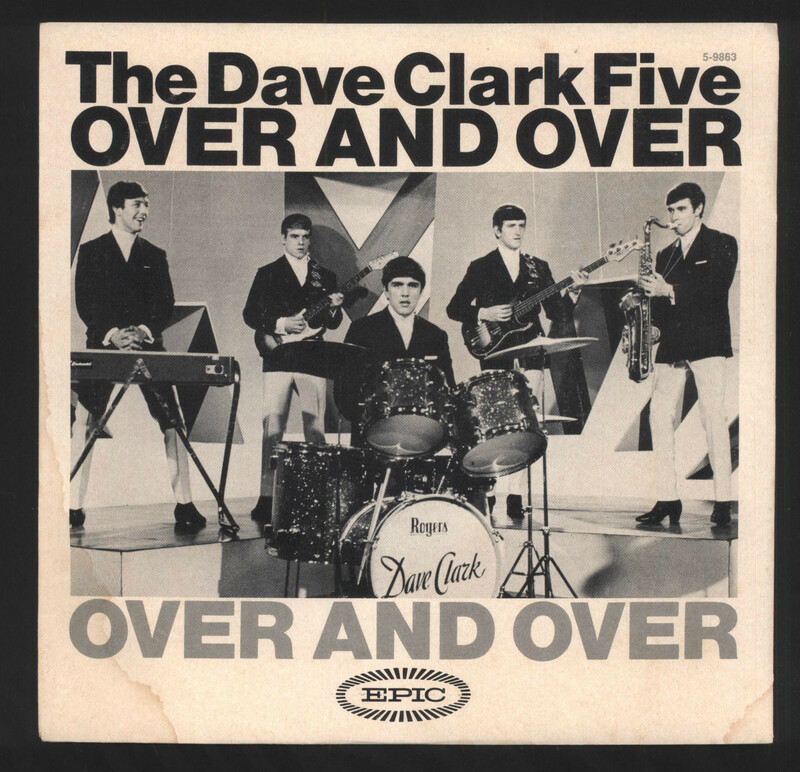 The Dave Clark Five are members of The Rock And Roll Hall Of Fame. During the 1960s British Invasion they were one of the major goups to reach American shores as their single releases sold in the tens-of-millions of copies. They were also one of the very few groups of the era never to have a reunion once they split. The band had alot of memorable hits including “Glad All Over,” “Bits And Pieces,” “Do You Love Me,” and “Can’t You See That’s She’s Mine.” Oddly their only number one hit was “Over And Over.” Released during the fall of 1965, it would spend one week on top of the BILLBOARD MAGAZINE Pop Singles Chart. It was a typical rocking DC5 release. They always managed to make their rock music catchy enough to make it perfect for AM radio play. The Dave Clark Five placed 24 singles on the American Pop Chart, 1964- 1967, but “Over And Over” was their biggest hit. 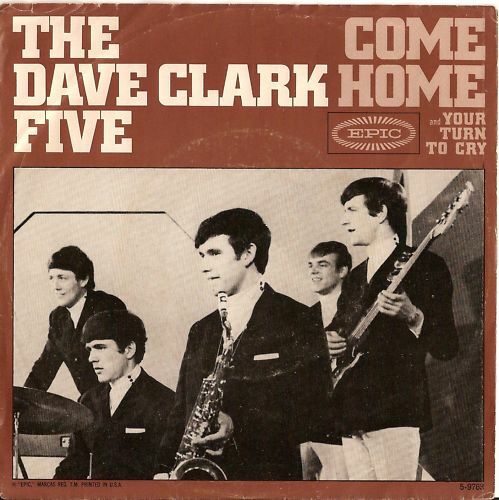 “Come Home” was one of the more mellow tunes in the Dave Clark Five catalogue. Released during January of 1965, it rose to number 14 on the BILLBOARD MAGAZINE Pop Singles Chart. The Dave Clark Five would sell tens of millions of records during the 1960s but would split during the early 1970s. They are one of the very few 1960s bands never to have had a reunion. They are now members of The Rock And Roll Hall Of Fame. The Dave Clark Five at one time were considered the equal of The Beatles. While that quickly passed, they produced a number of rocking singles that were some of the best of their era. 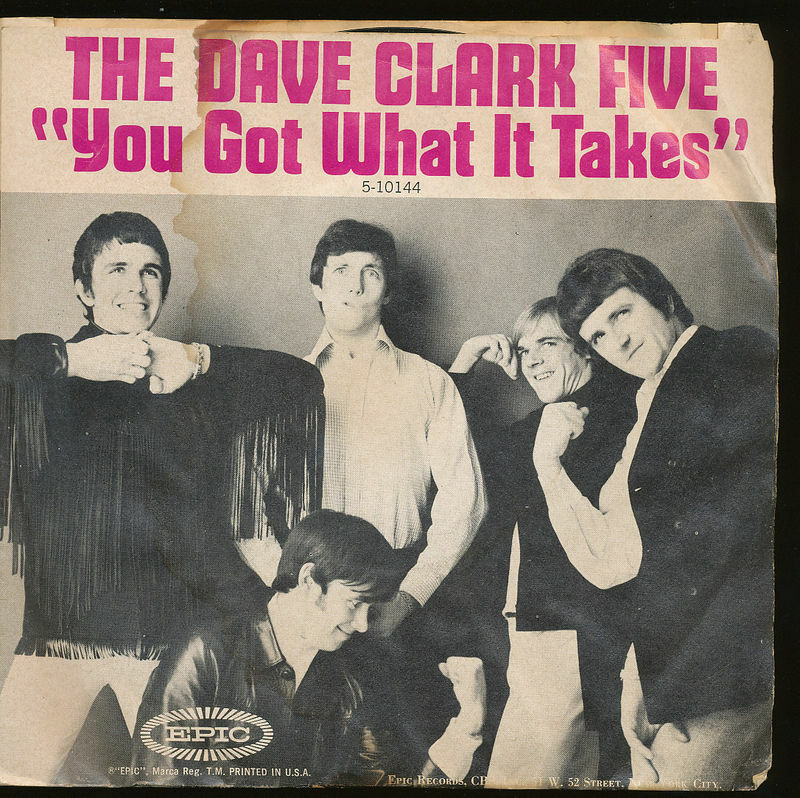 “You Got What It Takes” was issued during the early spring of 1967. It would prove to be their last big hit in the United States as their career was beginning to draw to a close. The single would reach number seven on the BILLBOARD MAGAZINE Pop Charts. It contained just about the grittiest vocal performance of Mike Smith’s career. The Dave Clark Five were one of very few groups never to have a reunion. They are now members of The Rock And Roll Hall Of Fame. You are currently browsing the archives for the Dave Clark Five Reviews category.